It’s no secret that printing privileges are often abused on college campuses—especially if those printers are available for use by students and faculty. Of course, some printing is required for legitimate academic purposes. But when you consider the costs of paper, toner, ink, and maintenance, out-of-control printing habits can quickly break the budget. Fortunately, there are several simple policies colleges can implement that help to curb irresponsible printing, and, by extension, save money on printing costs. Here are 4 must-have printing policies that save colleges money. One reason that print quotas are so popular is because they not necessarily require charging users for printing. For example, let’s say that each student is allotted $10.00 worth of printing per week. Each printer would then be assigned a cost to use, depending on size, color, and other functionality. If we assume that a single grayscale page has an assigned value of $0.10, then each user could print 100 pages before reaching their individual quota. Why is this strategy so effective? Currency is a familiar concept, so, even though people aren’t necessarily being charged out of their own pockets, they will naturally choose the cheapest way to print, which leads to less waste. Filters are another simple and effective way to control printing. They can be used to convert or restrict print jobs based on rules you set up. For instance, you may choose to automatically convert all student print jobs to be double-sided or black and white. Or, you could have your system detect and delete duplicate jobs. You can even create messages letting people know exactly why their job was restricted. The possibilities are endless for colleges looking for reduce printer waste. Sometimes, printer abuse is unintentional and the result of bad habits. Help to correct those habits by setting up reminders and alerts that appear when users try to perform certain actions. For example, set up pop-ups to remind people to print double-sided or to discourage color print jobs. One of the most common initiatives on college campuses is reducing environmental impact. By drawing users’ attention to their printing habits with reminders and alerts, you can help to modify their behavior and reduce waste. If your college uses a print management program such as PaperCut, your users can see an Environmental Impact calculator on their user web interface. The Environmental Impact Calculator calculates a person’s impact based on how many trees’ worth of paper they have used; how much carbon was used during paper production; and the energy used by manufacturing processes for producing paper. Want to track the printer use of a particular department or class? Implement shared accounts. For colleges and universities, shared printing accounts can help budget staff use via shared faculty or department accounts. You can also track printing costs by subject area, helping to nail down the most frequent users and work on strategies for reducing use. Want to lock down color print jobs for the Science department, or control print jobs over 100 pages for the English department? Shared accounts are a great way to increase accountability. Colleges and universities don’t need to continue thinking of out-of-control printing as a given. 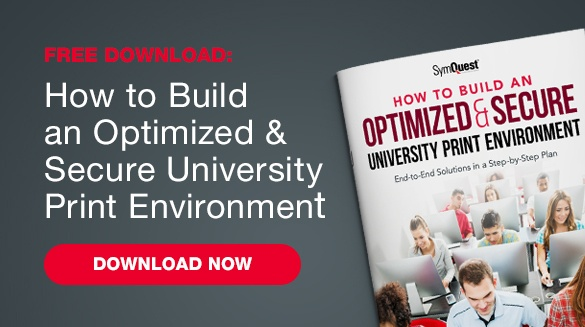 There are simple policies you can put into place to track, measure, and optimize your college print environments, no matter your users.